There was an exceptionally strong, although minor earthquake today Tuesday 26th February 2019 at 11:44 GMT (12:44 pm local time) centred around the area near the motorway junction for Albox. (Venta Overa) in Almería. It registered at 3.6M which is stronger than most of the recent small tremors. Here is an image of the effects on a map. It was felt as far North as Puerto Lumbreras, as far East as Mojácar, as far West as Purchena and as far South as Almería city! 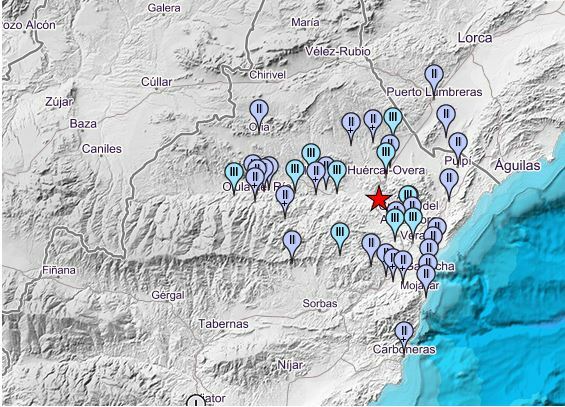 There was another little earthquake at 10:57 Spain time (09:57 UTC) which is shown on the map below. Very close to the Ballabona Hotel/Restaurant on the E15 motorway. Local residents described it as the biggest bang they had heard ever in Almería, although it was only recorded at 2.4. It does seem that the fault lines are becoming a little more active recently, though these minor tremors can be alarming, they are not dangerous. There was another minor earthquake graded at 1.9 at about 22:50 local time on Friday night 11th January 2019. The coordinates correspond to the place on the map below. The recent storms on the weekend of 17th – 18th December 2016, were a late gota fria which are usually a phenomena in Spain in September or October. Here are some videos from around the region, (Almería, Murcia, Alicante) showing some of the effects. Tragically, an old man washed away and drowned in Alicante. Rio Almanzora at Arboleas, normally a dry river bed!